"Anything can be 'inspired' by a true story! One day I pooped to the moon. INSPIRED BY A TRUE STORY??" One of Hollywood's promotional stock phrases that signals a considerable degree of adaptation modification. It can be applied to a true story as well to a work of fiction. In any case, it means that the source material has significantly altered. At least it will still be discernible, though you may have to squint a little. The phrase can come up in connection with a Dramatization or anything Very Loosely Based on a True Story. For similar stock phrases that more or less indicate the same degree of adaptation (un)faithfulness, see Suggested by... and Ripped from the Headlines. Several face creams have been advertised as "inspired by" genetics or "gene science" as they sometimes put it. Guess how much connection they actually have to the subject. Taco Bell has a little too much respect for its customers to claim to serve Mexican food of any degree of authenticity. Instead, they are careful to always refer to their food as "Mexican-inspired." Frozen is "inspired by" Hans Christian Andersen's The Snow Queen. Both of these works feature a queen with ice powers and a girl who goes on a dangerous journey through a winter landscape to find someone dear to her... and that's where the similarities end. Big Hero 6 is inspired by a Marvel Comics team with the same team. Disney took multiple liberties with the material, including where they're based,note In the comics, they're operatives of the Japanese government in the mainstream Marvel Universe; the film has them operate on their own in the Alternate History location of San Fransokyo - Word of God says it takes place in a universe where Japanese immigrants helped to rebuild San Francisco after the 1906 earthquake. the members' ethnic backgrounds,note In the comics, they're all Japanese; the movies Race Lifted them into a Five-Token Band). and the names of two characters (with Hiro getting his last name changed from "Takachiho" to "Hamada" and "Wasabi No Ginger" being shortened to "Wasabi").note GoGo's voice actress Jamie Chung. mentioned on twitter that GoGo's real name is Ethel, but this isn't revealed in the movie itself. Strange Magic is inspired by A Midsummer Night's Dream in that there are fairies and love potion shenanigans that complicate a Love Dodecahedron. That's about it. The Jungle Book was "inspired by" Rudyard Kipling's "Mowgli" stories. Walt Disney specifically told his staff not to read the original stories, instead advising them to have fun with the characters they were given to work with. The Miracle Woman was inspired by the real evangelical "healer" Aimee Semple McPherson. Troy was "inspired by" The Iliad according to its credits. Pretty accurate assessment. Although in all fairness, contemporary research implies that The Iliad was Very Loosely Based on a True Story itself. The movie Eight Below features an American team of eight sled dogs, six of whom survive for six months in 1993. It was "inspired by" a Japanese team of fifteen dogs, two of whom survived for one year in 1958. Alien Abduction (2014) was inspired by a real-life phenomenon called the Brown Mountain Lights, associated with a number of disappearances, though there is no concrete evidence that aliens were involved. Inverted in Eyes Wide Shut: while the ending credits state that the film was "inspired" by an Alfred Schnitzler's novella, it is in fact a rather faithful adaptation, down to the key pieces of dialogue. The opening credits for a Soviet film The New Adventures of Captain Vrungel state: "Screenplay by Alexander Khmelik, based on the memories of the novel by A. Nesterov". The Quiet Ones was inspired by the "Phillip Experiment," an experiment where a group of parapsychologists attempted to create an artificial poltergeist through expectation of human will. The results the participants reported, much of which were undocumented to begin with, were exaggerated for the movie; Also, the characters and circumstances were fictionalized, and the setting was moved from 1970s Toronto, Ontario to 1970s Oxford, England. The Apparition was an earlier film even more loosely inspired by the Phillip Experiment - about all it has in common with the "true events" is that it involves people in a college trying to summon a spirit as part of an experiment. Lemon Tree Passage is inspired by an urban legend of a ghost light that chases speeding cars along an isolated stretch of road in country New South Wales. While this is depicted in the movie, none of the other events have any connection to the legend. Vows of Deceit (aka Deadly Matrimony) - according to the Marvista Entertainment website - was "inspired by an unbelievable true story". The central plot, a con artist who marries multiple women to steal their money, is somewhat plausible. The part where the wives team up and hire a private detective? Maybe. But the Slasher Movie killer in a beekeeper mask? The bizarre climatic Wedding Day brawl between undercover bridesmaids and psycho hubby? Unbelievable indeed. Emperor Vakudos from Hottie 3: The Best Fan Fic in the World was inspired by Akudos Gill from Kaizoku Sentai Gokaiger and, to a lesser extent, Lord Vyce from Atop the Fourth Wall. Sleepless was inspired by Bootsy Slickmane's Insomnia. The author's notes for "Solaere ssiun Hnaifv'daenn" mentioned drawing inspiration from a comment by the previous writer in the literary challenge that "not everybody has a good Christmas." starswordc apparently was reminded of Bob Geldof rewriting the lyrics for "Do They Know It's Christmastime?" to draw attention to the 2014 West African Ebola epidemic, and that's where the plot of the ch'M'R Aen'rhien delivering drugs to fight a planetary epidemic came from. Courier's Mind: Rise of New Vegas ends each episode with the message "Inspired By Freeman's Mind." Follow the Leader indeed. This is used in-universe in the Land of Oz reimagining Was. L. Frank Baum was a substitute teacher at Dorothy's school as a child. He felt so touched by Dorothy's tragic life and her fantasy world of "Oz" that years later he wrote a book about an idealized life she should have had. The Cold Moons is a xenofiction fantasy book based upon the British badger cullings of the 1970s and 1980s. It stars a badger named Bamber as he tries to find other badgers after his entire family is killed. Spy miniseries The Assets, about notorious CIA mole Aldrich Ames, announces itself to be "inspired by true events". 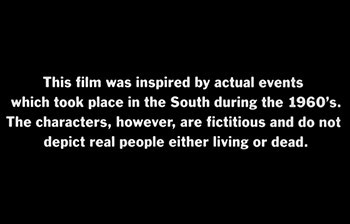 Ironically, it's more factual than the disclaimer makes it seem. In June 1997, Lela and Raymond Howard of Salado, TX, decided to set off for a festival in nearby Temple, despite Lela's Alzheimer's and Raymond recovering from brain surgery, and were found two weeks later, dead, at the bottom of a ravine near Hot Springs, AR—which is more or less in the same direction from Salado as Temple but is over 22.5 times further away. Tony Scalzo, frontman of a group called Fastball, read journalistic articles about this and was inspired to write "The Way ", which is a considerably more romanticized version of events—though the line "they'll never get old and gray" might imply that it still ends in death, just a considerably happier one. The Dum Cat series is reportedly inspired by the artist's real life experiences with their dim-witted pet.